Although vanilla uses NetHandlerPlayClient and NetHandlerPlayServer for sending packets, you should not use these when modding. The SimpleNetworkWrapper is provided for this purpose. To skip straight to sample code, click here (example 60). SimpleNetworkWrapper, which you use to define a channel for your communications as well as to register your IMessage and IMessageHandler. The IMessage and IMessageHandler are closely coupled. When registering them with SimpleNetworkWrapper, you need to provide a unique byte ID to identify the message type and its corresponding handler. 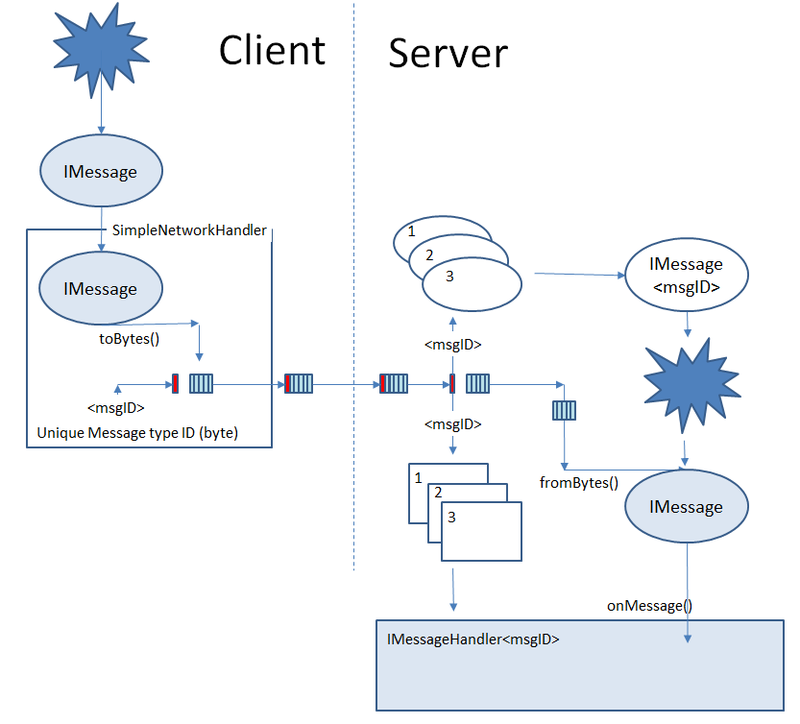 The generation, transmission, and receipt of a message (from Client to Server) is illustrated in the diagram below. Sending a message from Server to Client follows the same pattern. WARNING! The networking code is multithreaded and your MessageHandler needs to be very careful what it does to avoid crashing the game or introducing subtle, intermittent problems. See here.